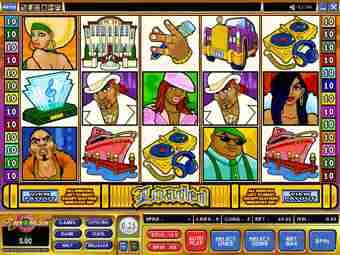 Latest Microgaming Viper Casino Games including Gift Rap, Dino Might, Bullseye and Atlantic City Blackjack and more. Where to play for free fun and get the best casino bonus offers.Find the best slot machine games here. Harvey's Bonus Video Slot: The graphics in this game deserve a special mention due to the high quality and the effective manner in which they introduce the food theme. Harvey’s is an up market dining and gaming experience with mouthwatering dishes that range from escargot and lobster to crème brulee and blueberry pie. Harvey the restaurateur is a man you will want to see too, because he is the Wild feature, substituting for a range of symbols to bring the coins in. An additional feature of the wild Harvey symbol is the variety of random wild symbol animations that will play when he substitutes for a winning combination, keeping the players entertained and amused. The after dinner mints are the Scatters. To end this banquet of bonuses, what could be better than a color and suit Gamble feature where you can double or quadruple your wins up to a maximum of 10 000 coins! Harvey’s is class all the way, but reasonably priced – and you’re sure to have a blast on this outstanding and very entertaining slot.Click here for more info on Harveys Video Slot. Sitting down at HARVEYS, the latest video slot at all good Microgaming Casinos is guaranteed to make you hungry for action and may even whet your appetite for the delicious dishes carrying the food theme on this brand new 25 line, 5 reel video slot that is packed with features. In addition to a juicy bonus, a Wild and Scatter reward, a Gamble feature and a new style of Free Spin Feature, Harveys introduces several firsts in video slot design. When the Free Spin Feature is triggered the player is randomly awarded between 6 and 30 Free Spins. Along with this new functionality, Harveys is also the first game to give you a mystery multiplier for each line win during the Free Spin Feature, giving more chances of better winnings. And it is the first video slot to take a massive 500 coins in the range 0.01 to 0.20.Starting at the rich end, you'll have cause to celebrate if a champagne cork pops on reels 2 and 4, because that's the trigger for the Free Spin Feature that can boost your rewards with a random number of free spins that will never be lower than 6 and could be as high as 30. Keeping the energy level up, every free spin has a mystery multiplier that can go to a stunning x25. Join the celebrations at all good Microgaming Casinos as a new slot is launched with a festival feel to it - MARDI GRAS is here! 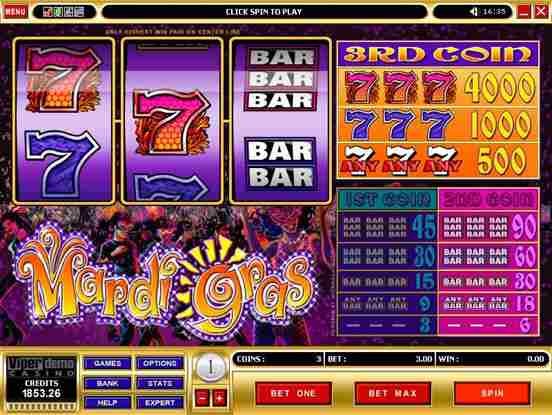 This is a straightforward, easy to use 3 reel, 1 payline slot on which you can wager anything from 0.25 to 5.00, and up to 3 coins at a time with a very generous jackpot in mind - 4000 coins or 20 000.00 when those three rainbow colored 7's line up. And you won't feel blue when only three 7s of that cool color arrive either, because that's 5 000.00 in your pocket or purse, too! Bet max for extra big wins. Multi-hand Bonus Blackjack is an American hole card game played with two standard decks of 52 playing cards that are shuffled before each game. There are bonus payouts within the game for which the player can qualify by placing a bonus side bet. The bonus payouts are determined by the hand combination of the first two cards dealt. The aim is to beat the Dealer's hand by either getting a higher value hand, without exceeding 21, or by the Dealer's hand going bust. A blackjack is the strongest hand and can only be matched - not beaten. Splitting and doubling down are allowed under specific circumstances and insurance is offered. This is the third of six game styles, which expands the game to new levels of entertainment and hopefully reward by empowering you to play up to 100 hands of video poker at a time with a wide choice of wagers. For the gambler with a good bankroll and a penchant for playing up to 100 hands simultaneously this is the ideal game. Outstanding features include generous pay tables and an Auto Hold facility that holds the mathematically superior cards in the hand, but plays these only when and if the player wishes it. In Deuces Wild every hand is dealt from a separate and independent deck of 52 cards. The Deuces in the deck are wild and substitute for any card to complete a winning hand. The Deuces are cards with a face value of 2. GIFT RAP – Celebrate the festive season with a unique Video Slot that packs a real punch in terms of entertainment, action and rewards, all wrapped in a fun Hip Hop style! This 25 line, 5 reel game can really make you carol this Christmas with a stunning 30,000 jackpot coins boosted by even more if the bonuses work for you. Look out Jurassic Park! Dino Might is an explosive new the 25-payline, 5-reel Video Slot. The top quality graphics carry a prehistoric theme loaded with fossils, amber-entombed insects and some very large and fearsome dinosaurs! Collect 3, 4 or 5 Triggersaurus symbols on a line and it opens up line bonuses to boost your wins. The Map Bonus gives you a chance to hunt round the area for the hidden missing treasure. Get on target with Bulls Eye: a straightforward 3-reel, 1-payline, 3-coin game that gets right down to business with a jackpot that pays out a shimmering river of 5 000 coins! Look out for the darts player who signals the Wild feature - get one of this guy on the payline and your winnings double; two and it quadruples, and he substitutes for most other symbols, too! This is the second in this popular series and one that promises all the excitement of an American hole card game enhanced by a player-capability to generate action on five hands at once on a traditionally single hand game. The feel is slick, fast and smooth, with the latest gaming software technology underlying crisp, realistic graphics. Loaded Video Slot is an extremely entertaining 25 Line, multiple coin game with a humorous over the top, Bling Bling money theme. The Free Spin feature has a choice element. The player gets to select the number of free spins he wishes to play from the options of 12, 16 or 24 and each option has a multiplier associated to it. A hip hop rapper named Triple 7 is the Wild Symbol and he triples all winning combinations. Triple 7’s Bling Ring is a scatter symbol and will trigger the Free Spin Feature when 3 or more appear on the reels. There is also a Gamble Feature where you can double or quadruple your winnings. Muchos Grande Video Slot is sure to be successful, with its great combination of American and Aussie game functionality including a 2 nd screen Bonus Game Feature. 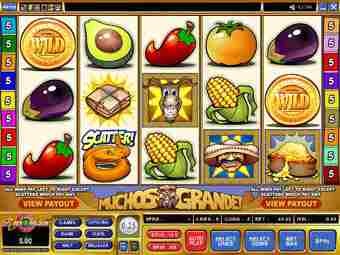 Muchos Grande has a Treasure theme, with players able to bet up to 5 coins on each of the 15 paylines, taking the maximum wager per spin to 75 coins. The Rattler symbol is the scatter symbol and the Gold Coin is the Wild Symbol which substitutes for all symbols except the scatter and bonus trigger. 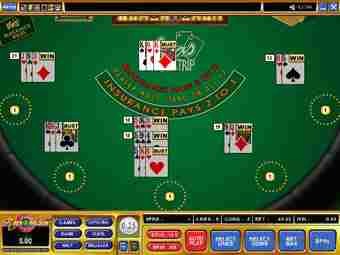 The tremendous appeal of the Microgaming multi-play Power Poker is now well accepted. 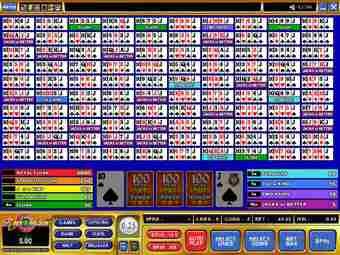 This great game has been expanded to new levels of excitement that allow you to play up to 100 hands of video poker at a time with a wide choice of wagers. Outstanding features include generous pay tables and an Auto Hold facility that holds the mathematically superior cards in the hand, but plays these only when and if you wish. In Jacks or Better every hand is dealt from a separate and independent deck of 52 cards. All games come on the Microgaming Viper platform, adding the very advanced attributes of this outstanding software to the major appeal of the games. This gives the suite a significant advantage over the only other product of this type on the market. 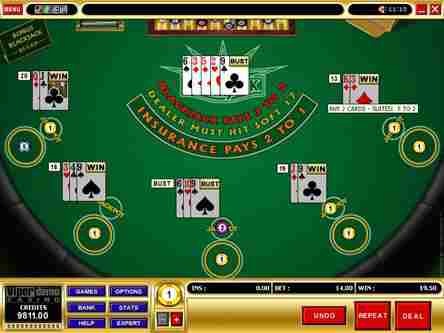 This is the multi-hand version of the popular single hand blackjack game Vegas Strip. Vegas Strip Blackjack is played with four standard decks of 52 playing cards that are shuffled before each game. It is an American Hole Card game. The aim is to beat the Dealer's hand by either getting a higher value hand, without exceeding 21, or by the Dealer's hand going bust. In Multi-Hand Vegas Strip Blackjack, you can bet up to 5 hands at a time. Blackjack is the strongest hand in Vegas Strip Blackjack. It cannot be beaten, only matched. Splitting and Doubling Down are allowed under specific circumstances and Insurance in offered.